Our top-priority is keeping Willow Park and Maple Ridge residents informed. 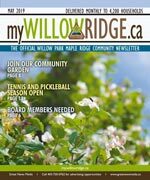 All the community’s must-know news is easily accessible through the Willow Park and Maple Ridge community newsletter, which is published monthly so that residents are kept current on relevant community and Calgary news. My Willow Ridge is delivered monthly to every household, apartment, and business, and is a great way to get hyper local advertising exposure. The Willow Ridge community association is active in providing programming for residents. There is a playschool for local youngsters, as well as an out of school program. Other groups, and activities, such as the Cubs, Brownies, dog obedience training, yoga, seniors activities and youth soccer take place at the hall as well. Tennis courts and a skating rink are also located nearby. In the City of Calgary’s 2012 municipal census, Maple Ridge had a population of 1,910 living in 811 dwellings, a -3.4% increase from its 2011 population of 1,978. With a land area of 2.8 km2 (1.1 sq mi), it had a population density of 682/km2 (1,770/sq mi) in 2012. Residents in this community had a median household income of $72,317 in 2000, and there were 10.3% low income residents living in the neighborhood. As of 2000, 12.5% of the residents were immigrants. All buildings were single family detached homes, and 6.1% of the housing was used for renting. For more detailed info visit the City of Calgary community profiles site.